Above average temperatures look to continue through the first half of this week before an anticipated cold front brings cool temps in for the second half of the week and into the weekend. Unfortunately, this cold front and rain will likely move through Wednesday evening, during the peak of Halloween festivities. Lots of events will be ongoing, but you should go ahead and prepare for rain that night. Our brief period of "warming up" will continue through the first half of this week. A high pressure systems remains situated over the southeastern portion of the U.S., but that is expected to change in the coming days. As our anticipated low pressure system (bringing us the cold front on Wednesday) moves closer to our area, this high pressure will continue to get pushed farther to the east. For the remainder of today and into tomorrow, skies will remain mostly clear. Although, we will begin to see a slight increase in cloud cover tomorrow. Something interesting to note is as this high pressure gets moved to the east, with the decreasing pressure to our west, we will see a noticeable difference in our winds on Tuesday and Wednesday. Both days, winds could reach 15 mph with gusts upwards of 25 mph. If you have Halloween decorations out, you may want to ensure that they are secure as gusts could make some loose decorations go flying. As for our temperatures through the first half of the week, we will stay pretty warm if you ask me. Highs will reach near 81 on Tuesday and near 76 on Wednesday, both of these are considered above average for late October. Temps will stay fairly mild tonight and tomorrow night with lows near 56 tonight and near 66 Tuesday night. Wednesday will be when we really begin to notice things changing in our weather pattern thanks to a cold front that will pass through the area. We know that Wednesday is Halloween and a lot of you likely have plans of some kind. For that reason, we decided to include a Q&A that will hopefully answer any questions you may have about trick or treating! 1. What time will the rain arrive? We are expecting for the majority of the showers/thunderstorms to move through Wednesday afternoon into Wednesday night. A scattered shower or two will be possible earlier in the day, but the majority will hold off until later in the day, with rain most likely after 4pm and well into the nighttime hours. 2. How much rain are we talking? Pretty much everyone will see rainfall on Wednesday, but amounts will likely vary depending where the heaviest bands of precipitation move through. Generally speaking, anywhere from an inch to potentially even three inches will be possible. 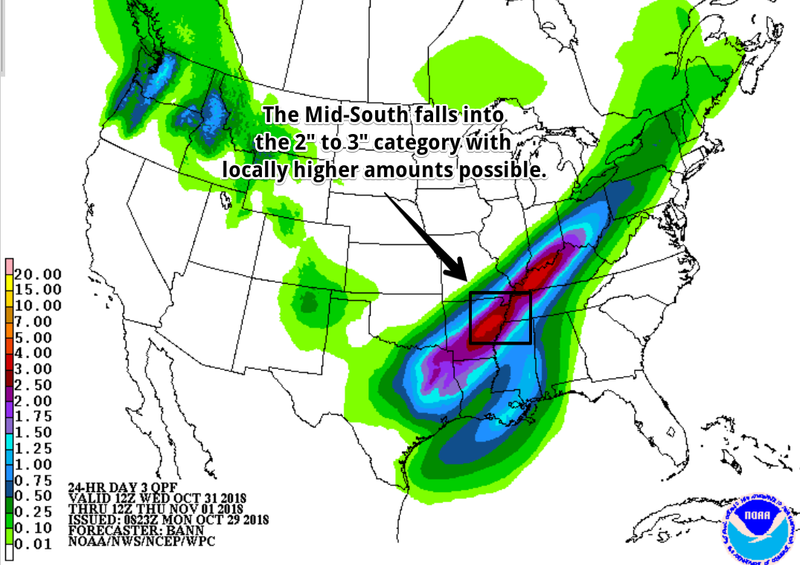 Locally higher amounts could be possible as well. While widespread severe weather is not expected (more on this later), heavy rainfall could become an issue on Wednesday evening. The Weather Prediction Center has included us in their "slight" risk for excessive rainfall for Wednesday. Essentially, this highlights our area for having a lot of rainfall over a short amount of time, which could lead to some ponding of water and localized flooding issues. This will be something to keep an eye on as we get closer to Wednesday evening. but that will make for some VERY wet children and chaperones if this pans out! 3. Thunderstorms too? Could any be severe? Thunderstorms will certainly be possible, especially Wednesday evening, as the main line pushes through the area. In general, heavy rain and lightning appear to be the main concerns, but an occasional strong wind gust can't be completely ruled out. 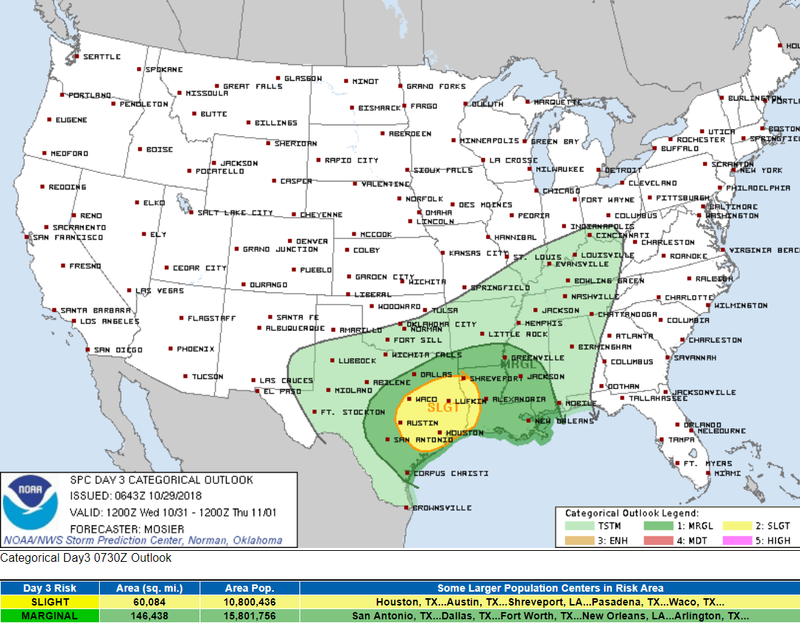 At this time, there does not appear to be a widespread severe weather threat. 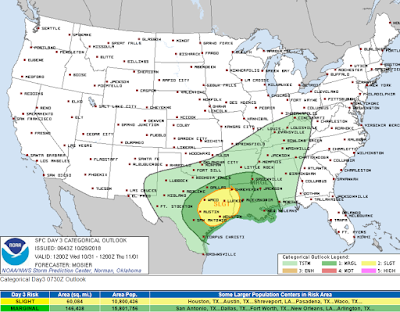 The Storm Prediction Center keeps the severe threat to our southwest, with only a "general thunder" risk over our area. But that still means a chance of thunder and lightning, and we definitely wouldn't want any of you becoming a lightning rod for Halloween! 4. How about the temperatures? Assuming the rain and thunder forecast becomes a bit more favorable, will it be cold, or sweaty? Temps will generally be in the lower 70s/upper 60s through the early evening hours before dipping into the mid 60s through the remainder of the evening. The persistent showers will likely make it feel a bit cooler than this throughout the evening. 5. A lot of wind too? As discussed in the previous section, winds will become fairly gusty on Wednesday and into Wednesday evening. Winds will remain from the southwest around 10 to 15 mph with gusts upwards of 25 mph. Having a way to secure any Halloween decorations and/or a hat to go with your costume would be advised. 6. Tell it to me straight. Are you confident all this will occur? We are confident that it is going to rain on Wednesday night unfortunately. Umbrellas would be advised if you are planning to embrace the rain. What we are "less" confident about would be thunderstorms and their severity. This is something to keep an eye on over the next few days, but at this time heavy rain, lightning, and a couple of strong wind gusts appear to be the main concerns. Honestly, it's not really looking that great. The hope is that it is all delayed a couple hours and maybe some early candy-grabbing can take place! We will begin to shift back into a cooler temperature and hopefully somewhat dry pattern starting on Thursday. Leftover showers from Wednesday's frontal passage could remain Thursday morning, but should begin to clear out by the afternoon. Enough moisture Friday into the weekend causing scattered showers to remain possible, but coverage should not be widespread and I expect most weekend activities to be quite pleasant actually. Highs look to stay in the 60s through the weekend with overnight lows in the 40s. 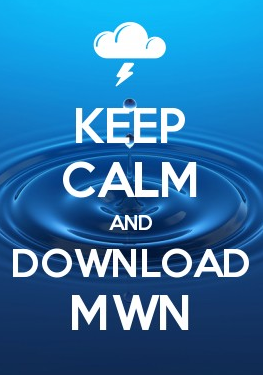 Follow MWN on Facebook and Twitter for routine updates and the latest info!